Sutton, R. T.: ESD Ideas: a simple proposal to improve the contribution of IPCC WGI to the assessment and communication of climate change risks, Earth Syst. Dynam., 9, 1155-1158, https://doi.org/10.5194/esd-9-1155-2018, 2018. The process of drafting the Working Group I (WGI) contribution to the Sixth Assessment Report of the Intergovernmental Panel on Climate Change (IPCC AR6) began recently with the first lead author meeting held in Guangzhou, China, in June 2018. An issue that merits greater attention than in previous WGI reports is the assessment and communication of risk. It is now widely accepted that it is appropriate – and necessary for decision-making – to frame climate change as a problem in risk assessment and risk management (King et al., 2015; Weaver et al., 2017). In the AR5 greater use was made than in previous assessment reports of a formal risk assessment framework which spans the dimensions of hazard, exposure and vulnerability (IPCC, 2014). However, risk framing had little influence on the WGI report, and this should be addressed in AR6. A common measure of risk is likelihood × impact (Fig. 1). It is standard practice in risk assessment to highlight both the most likely impacts and low-likelihood high-impact scenarios. Such scenarios merit specific attention because the associated costs can be extremely high, so decision makers need to know about them. It follows that WGI has a responsibility to assess and explicitly communicate the scientific evidence concerning potential high-impact scenarios, even when the likelihood of occurrence is assessed to be small. In past reports the assessment of key parameters by WGI has focussed overwhelmingly on likely ranges only. When information has been provided about the tails of distributions only likelihoods have been communicated using terms – following the IPCC's uncertainty guidance (Mastrandrea et al., 2010) – such as “very unlikely” or “extremely unlikely”: a clear steer that policymakers should largely ignore such possibilities. But this is wrong. Policymakers care about risk, not likelihood alone. The IPCC's uncertainty guidance is valuable, but by itself it is insufficient to guide the assessment of risk. In particular, the focus on likelihood terminology that is symmetric with respect to high- and low-impact scenarios downplays the importance of low-likelihood high-impact risks (Fig. 1). 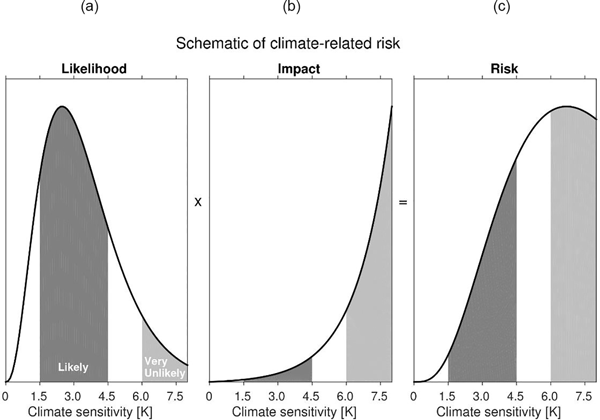 Figure 1A schematic representation of how climate change risk depends on equilibrium climate sensitivity (ECS). (a) A possible likelihood distribution consistent with the IPCC AR5 assessment that “Equilibrium climate sensitivity is likely in the range 1.5 to 4.5 ∘C (high confidence), extremely unlikely less than 1 ∘C (high confidence) and very unlikely greater than 6 ∘C (medium confidence)”. (b) A schematic illustration of the fact that, for a given emissions scenario, the cost of impacts and adaptation rises very rapidly (shown here as an exponential damage function) with ECS. (c) In this example, the resultant risk (quantified here as likelihood × impact) is highest for high ECS values. The precise shape of the risk curve is dependent on assumptions about the shape of the likelihood and damage functions at high sensitivity (Weitzman, 2011) (figure by Ed Hawkins). I suggest the WGI authors should agree on a modest number of key parameters for which an assessed physically plausible high-impact scenario (PPHIS) or storyline (e.g. Zappa and Shepherd, 2017) can be provided. This should be done for core parameters such as climate sensitivity and TCRE (the transient climate response to cumulative carbon emissions: Allen et al., 2009; Matthews et al., 2009) and could also be done for some large-scale impact-relevant metrics (informed by WGII), such as the magnitude of increases in extreme rainfall. There will be a need to agree on consistent procedures for the definition, description and use of such storylines; for example, they could be associated with a specific assessed likelihood, and their characterisation should emphasise physical constraints and evidence, not model results alone. This will be helped by a growing literature on which to draw (e.g. Hazeleger et al., 2015; Zappa and Shepherd, 2017). Physically based high-impact storylines are distinct from socioeconomic scenarios, but the WGI report could usefully provide information on outcomes that could arise from a combination of e.g. high climate sensitivity and a high-emissions scenario. an assessed physically based storyline for specific aspects of future climate change that is consistent with all available evidence and would result in impacts that are substantially greater than those implied by the relevant likely range. With regard to likelihood, I propose that WGI should base PPHIS on scenarios that are assessed to be very unlikely (0 %–10 %) rather than extremely unlikely (0 %–5 %) or exceptionally unlikely (0 %–1 %). In the context of deep uncertainty, attempts to quantify the likelihood of a PPHIS more precisely are unlikely to be fruitful and are not necessary to provide information that is useful for risk assessment (see e.g. http://www.deepuncertainty.org, 27 September 2018). Information about impacts should be limited in WGI to physical climate variables but should be quantitative where possible and include an assessed confidence level. WGII could make use of the WGI PPHIS to provide further information about impacts; this would help with coordination between the working group reports and the production of the AR6 Synthesis Report. Potential abrupt changes have long been recognised as an important risk-relevant issue for IPCC WGI to assess (e.g. Sect. 12.5.5 in Collins et al., 2013). However, abrupt changes are only a subset – and not obviously the most important subset – of PPHIS. It is notable that hardly any information about abrupt changes was included in the AR5 WGI Summary for Policymakers, and where information was included (e.g. for the Atlantic Meridional Overturning Circulation, Sect. E.4 in IPCC, 2013), it addressed likelihood only with little or no information provided about impact. ECS. It is very unlikely that ECS is greater than 6 ∘C (medium confidence) but this value may be considered a physically plausible high-impact scenario (PPHIS). If realised, such a value for ECS would very likely result in an increase in global mean temperature by 2100 well above 2 ∘C relative to 1850–1900 under all RCP scenarios except RCP2.6 (high confidence). Sea level. A partial collapse of the marine-based sectors of the Antarctic ice sheet is considered unlikely during the 21st century (medium confidence). However, if realised this PPHIS could cause an additional contribution to sea level rise of up to several tenths of a metre during the 21st century (medium confidence). Some will argue that the WGII report is needed to provide information on impacts. For detailed information this is certainly the case, but the general shape of the damage function for a large basket of impacts (Fig. 1) is insensitive to such details and is all that is needed to justify WGI providing a much more thorough assessment of relevant scenarios. Other critics will suggest that for WGI to explicitly identify high-impact scenarios would constitute scaremongering; this concern is no doubt one reason why previous WGI reports have focussed so much on the likely range. But it is misguided (see also Emanuel, 2014). Policymakers need to know about high-impact scenarios and WGI has a responsibility to contribute its considerable expertise to making the appropriate assessments. The author was a lead author of the WGI contribution to the IPCC Fifth Assessment Report and a participant in the scoping meeting for the Sixth Assessment Report. I would like to thank Ed Hawkins for making the figure and for valuable discussions. I would also like to thank Ted Shepherd and all the reviewers and referees for their valuable comments, which improved the paper. Allen, M. R., Frame, D. J., Huntingford, C., Jones, C.-D., Lowe, J. A. Meinshausen, M., and Meinshausen, N.: Warming caused by cumulative carbon emissions towards the trillionth tonne, Nature, 458, 1163–1166, 2009. Collins, M., Knutti, R., Arblaster, J., Dufresne, J.-L., Fichefet, T., Friedlingstein, P., Gao, X., Gutowski, W. J., Johns, T., Krinner, G., Shongwe, M., Tebaldi, C., Weaver, A. J., and Wehner, M.: Long-term Climate Change: Projections, Com mitments and Irreversibility, in: Climate Change 2013: The Physical Science Basis. Contribution of Working Group I to the Fifth Assessment Report of the Intergovernmental Panel on Climate Change, edited by: Stocker, T. F., Qin, D., Plattner, G.-K., Tignor, M., Allen, S. K., Boschung, J., Nauels, A., Xia, Y., Bex, V., and Midgley, P. M., Cambridge University Press, Cambridge, UK and New York, NY, USA, 2013. Emanuel, K.: Tail risk vs. Alarmism, available at: http://climatechangenationalforum.org/tail-risk-vs-alarmism (last access: 27 September 2018), 2014. Hazeleger, W., van den Hurk, B. J. J. M., Min, E., van Oldenborgh, G. J., Petersen, A. C., Stainforth, D. A., Vasileiadou, E., and Smith, L. A.: Tales of future weather, Nat. Clim. Change, 5, 107–113, https://doi.org/10.1038/nclimate2450, 2015. 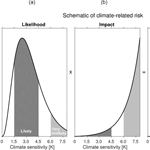 King, D., Schrag, D., Dadi, Z., Qui, Y., and Ghosh, A.: Climate change: a risk assessement, Cambridge University Centre for Science and Policy, Cambridge, 2015. Mastrandrea, M. D., Field, C. B., Stocker, T. F., Edenhofer, O., Ebi, K. L., Frame, D. J., Held, H., Kriegler, E., Mach, K. J., Matschoss, P. R., Plattner, G.-K., Yohe, G. W., and Zwiers, F. W.: Guidance Note for Lead Authors of the IPCC Fifth Assessment Report on Consistent Treatment of Uncertainties, Intergovernmental Panel on Climate Change (IPCC), 2010. Matthews, H. D., Gillett, N. P., Stott, P. A., and Zickfeld, K.: The proportionality of global warming to cumulative carbon emissions, Nature, 459, 829–832, 2009. Weaver, C. P., Moss, R. H., Ebi, K. L., Gleick, P. H., Stern, P. C., Tebaldi, C., Wilson, R. S., and Arvai, J. L.: Reframing climate change assessments around risk: recommendations for the US National Climate Assessment, Environ. Res. Lett., 12, 08021, 2017. Weitzman, M.: Fat-Tailed Uncertainty in the Economics of Catastrophic Climate Change, Rev. Environ. Econ. Policy, 5, 275–292, https://doi.org/10.1093/reep/rer006, 2011. Zappa, G. and Shepherd, T. G.: Storylines of atmospheric circulation change for European regional climate impact assessment, J. Climate, 30, 6561–6577, https://doi.org/10.1175/JCLI-D-16-0807.1, 2017.